"This research indicates that not only could asteroids be possible sources of raw materials, but they could be the fueling stations and watering holes for future interplanetary exploration." That's Don Yeomans, the manager of NASA's Near-Earth Object Program Office at the Jet Propulsion Laboratory in California, talking about this morning's news in Nature that signs of water ice and organic compounds have been discovered on an asteroid. See Yeomans' full comments. This is big news for the scientific community. Previously, scientists believed that asteroids within a certain distance of the sun are too close to the energy of our home star to maintain any water ice. That the asteroid 24 Themis, a mere 297 million miles from the sun, boasts the infrared signatures of both organic compounds and water ice lends credibility to theories that say that Earth's water and other organic compounds were delivered to the planet after its initial geological formation. But what about the space exploration communities? The other parts of NASA, the people concerned with human spaceflight, don't seem to be reacting to 24 Themis' water news. As Yeomans indicates, the discovery of water ice on a near-Earth object could open up some possibilities for human exploration of the solar system. So why the relative silence? Maybe it's because lately, it doesn't seem like the United States will ever get to a point where interplanetary exploration is a reality. Right now, the space shuttle is set to retire at the end of 2010 with Endeavour's last mission. President Obama's budget, which allocates more money to NASA for the types of research that could reveal other asteroids and near-Earth objects with watering hole capabilities, scraps the still-in-progress Constellation program. Constellation was supposed to be the shuttle's successor: a reusable, modular heavy-lift rocket and crew vehicle that would put the moon and probably Mars back within the reach of U.S. astronauts. The loss of both the shuttle and Constellation puts the United States astronaut corps completely at the mercy of Russian and other international space agencies. Put another way: The U.S. won't be able to put a person on orbit, on the international space station or otherwise, without paying a significant cost. Which means that assuming all remaining shuttle flights launch as planned, by 2011, for the first time in 49 years, the United States will no longer be the No. 1 country capable of manned space flight. Instead, we'll cede orbital supremacy to Russia, Japan, China - all countries that either have capabilities at the moment or are on track to have them in the foreseeable future. And we will literally pay them for the privilege of being second-best. 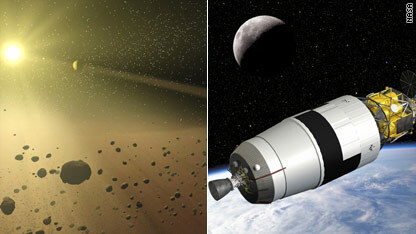 To be fair, Obama's NASA budget allocates funds to the development of private spacecraft for human flight. There's a chance that the United States won't give up that No. 1 slot. But there's also a good deal of skepticism as to whether the private sector will be able to develop the crafts needed to restore U.S. manned spaceflight capability in a timely fashion. As David Waters, reporter for SpaceflightNow.com and former public affairs officer for United Space Alliance, points out, "NASA may have set the ball in motion for commercial companies to start flying astronauts, but let's not lose sight of the fact that we're years away from that happening." Apollo astronauts Neil Armstrong (Apollo 11), Jim Lovell (Apollo 13) and Gene Cernan (Apollo 17) have all also expressed their thoughts about scrapping Constellation, saying that the U.S.' loss of the ability to get to low-Earth orbit is going to cost this country a lot more than the $50 million to $60 million per seat on a Russian Soyuz. It's also going to cost knowledge, training and experience that space personnel, both NASA and private-sector, gain as machinery is developed and built and as astronauts train and fly. It's also probably going to cost human space exploration public favor and attention. It's no secret that the general public pays far less attention to spaceflight than it did during Apollo's heyday in the '60s and '70s. So what will happen if the U.S. doesn't launch a person for 10, 20, 30 years? How long will it take before the American public regains its enthusiasm for the costly, risky challenge that is spacefaring? How many potential young scientists, engineers, pilots, astronauts and space geeks will turn their attentions and energies elsewhere without NASA flying? Someone somewhere is imagining the day that a craft emblazoned with the familiar NASA logo reaches orbit around an asteroid, refills its water tanks and continues on through the solar system. The knowledge humanity would gain from such a flight is the stuff of dreams. But right now, such a day exists only in science fiction. While the data gleaned from 24 Themis will probably continue to inform theories of the Earth's origin and formation, with Obama's new budget and NASA's new plans for the future, it seems unlikely that NASA spacecraft will ever use Yeomans' asteroid pit stops. We were awake for more than twenty-four hours in the singular pursuit of one goal: We had a shuttle to catch. The Space Shuttle Discovery. One of NASA's final shuttle missions blasted off from Kennedy Space Center yesterday morning at 6:21:25 EDT, just as the sun was edging towards daybreak - the last shuttle mission scheduled to blast off into night skies. This mission and crew are special for a few reasons: it will mark the first time that four women are in orbit simultaneously. It will mark the first time that two Japanese Aerospace Exploration Agency (JAXA) astronauts are in orbit at the same time. This is Discovery's second-to-last scheduled trip to space, and the last time that a Shuttle crew will comprise seven people. It is also the last time that a rookie will fly aboard the Shuttle. The milestones are plentiful - like most Shuttle missions, NASA and its partners have made sure the 13-day flight will be nonstop activity. But for our little crew of three, this launch was unique because it represented a geek dream realized: The three of us have been space enthusiasts, NASA supporters and star gazers for most of our lives. With only four (now three) scheduled launches remaining in NASA's Shuttle program, we were running out of chances to witness a launch in person. And witness one we did. After weeks of delays due to cold weather and leaky-valve technical issues, Discovery was finally on the launch pad and ready to go. The countdown proceeded smoothly through the course of the night, sliding in and out of planned wait periods with nary a hint of a problem. We watched the clock tick down, standing a few feet from those iconic yellow numbers. All told, we spent roughly seven hours at Kennedy Space Center, photographing the stars, the moon, the xenon-lit Shuttle and the people who had come to quite literally feel the earth move. At T-3 seconds, we saw more than felt the three main engines light. 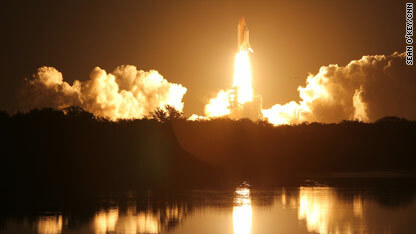 At T-0 we could see enormous clouds of vapor and smoke billowing beneath the Shuttle as Discovery lifted off the pad. The sky brightened faster than any sunrise. And then, the roar: the ground-shaking, chest-thrumming bass announcement of several million pounds of thrust pushing seven people into orbit. Accompanying it, the hundreds of shutter clicks as hundreds of photographers scrambled to get the perfect shot. Then, just as swiftly as it began, it was over. In what felt like a split second, Discovery was out of sight, its thunderous roar fading quickly back to a quiet coastal dawn, leaving only a contrail that marked the sky. The three of us kept moving, kept shooting, kept talking, completely astounded at the sheer force - physical and mental - that this agglomeration of engineering and ingenuity produced on this early Monday morning.